Russian President Vladimir Putin has resisted EU calls to sign an existing international treaty on investment and trade in energy. But says he thinks Russia and the EU can agree binding rules. They begin talks on a new strategic partnership in the next few weeks, and Mr Putin says he is confident it would be possible to find common approaches. At an EU summit in Finland, Mr Putin also hit out at Georgian leaders, accusing them of building up forces. The EU has been trying for years to get Russia to sign the Energy Charter Treaty without success. It now wants to enshrine many of the treaty's principles into the new framework agreement with Russia. The aim is to make it easier for European companies to invest in the Russian energy sector, and to use Russian pipelines to export the oil and gas they produce. The pact would also be designed to ensure that Russia treated all European countries equally, and to lay the basis for a long-term trade partnership. Russia supplies a quarter of the oil and gas consumed in the EU, and the proportion is set to rise sharply in coming decades. 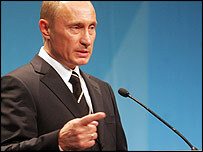 Mr Putin suggested that Russia could agree to most of the charter's principles when negotiations begin. "We are not against the principles that are included in the charter, but we believe that that certain provisions of the charter should be defined better," he said. "I am quite confident that we will be in a position to develop common approaches." Mr Putin echoed European leaders by saying that energy co-operation needed to be rooted in the principles of predictability of energy markets and the mutual interdependence of suppliers and consumers. The BBC's Jonny Dymond in Lahti says Mr Putin was on a charm offensive, but there was no sign of progress on any of the really difficult issues. European Commission President Jose Manuel Barroso said the two sides needed to develop mutual trust. "That requires transparency, the rule of law, reciprocity, non-discrimination, market opening and market access," he said. The EU wants European investors to have the same access to the Russian energy market as Russian companies have to Europe's market, and the ability to use Russian pipelines to export any gas and oil they produce in Russia. European governments have recently raised concerns about the treatment of some European energy investors attempting to develop oil and gas resources in Russia. Energy security became a major priority for the EU after Russia briefly cut off gas to Ukraine in January, in a dispute over payment. A paper prepared for the summit by the European Commission stressed the importance of increasing energy imports from the Mediterranean, Black Sea, Caspian, Middle East and Gulf regions. The EU leaders said before the summit that they would make clear their hopes that Russia would be able to find the killer of the murdered journalist, Anna Politkovskaya. On Georgia, Mr Putin said that Russia had not started the latest round of tensions between the two countries. "The issue does not lie between Russia and Georgia, the issue is between Georgia and South Ossetia and Abkhazia," he said, referring to Georgia's two Russian-backed breakaway territories. He accused Georgian leaders of seeking to take control of the regions by military force, and said a Georgian military build-up was the cause of the latest trouble. The Georgian government reacted angrily to Mr Putin's comments, calling an immediate press conference.